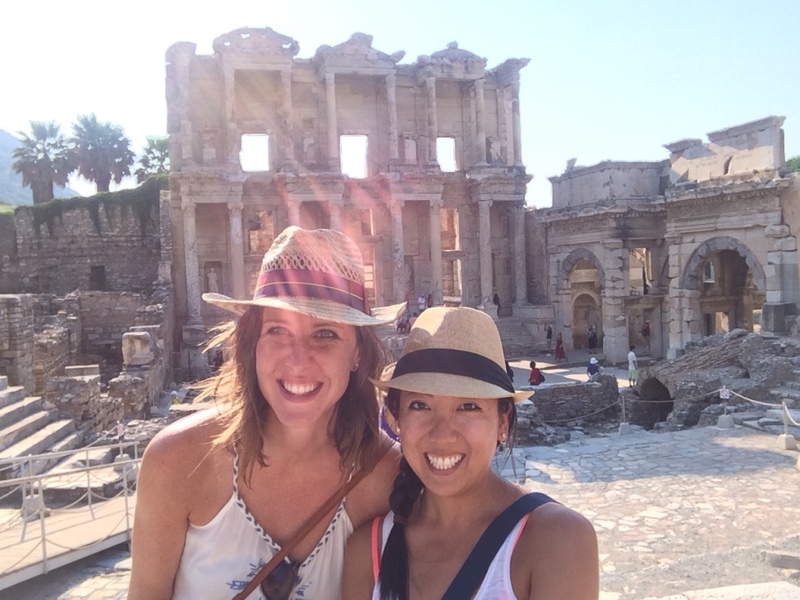 Sam and I spent the morning in transit, as we headed from Çeşme to the ancient city of Ephesus today. Ephesus is an ancient Greek city that dates back to the 10th century BC. 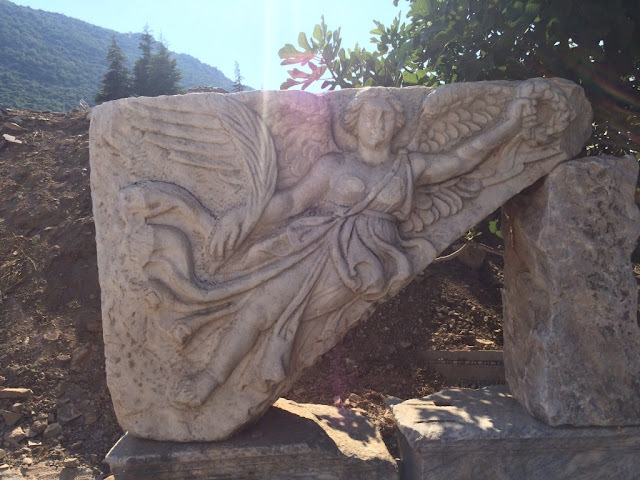 It was a capital of the Roman Asia Minor and was an incredibly important city, as it was a super wealthy and prosperous trading port that was considered only second in importance to Rome back in the day. At its peak, it had a population of over 250K people. 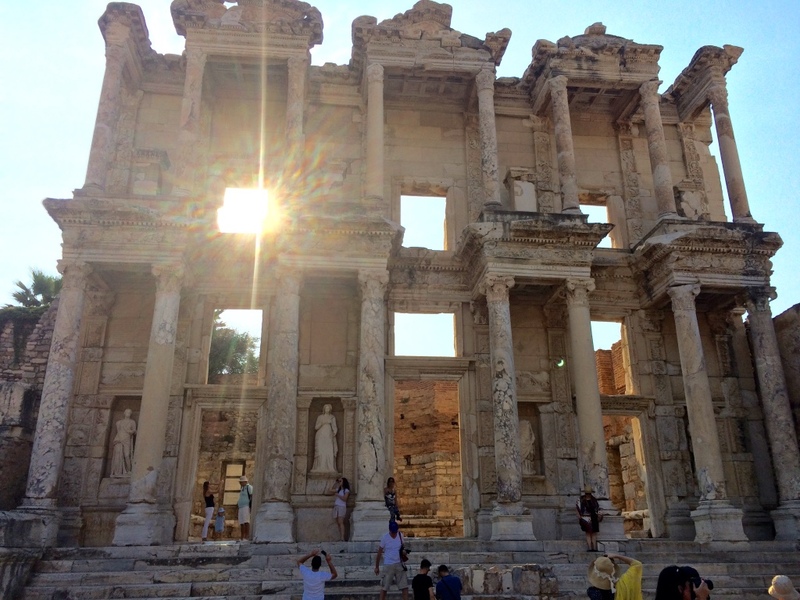 The ruins at Ephesus are considered the best-preserved ruins in the Mediterranean. 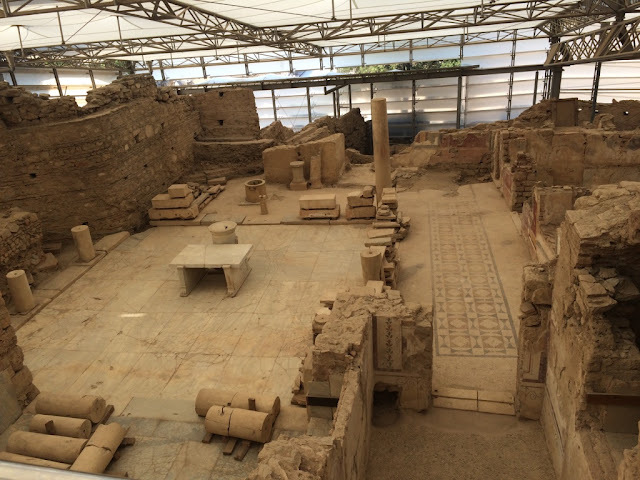 After 150 years of excavations, only 18% is excavated today - which is crazy because the place is HUGE. I've visited my fair share of ruins before, but was still awestruck by the scale, sophistication, and grandeur of the buildings and roads. For insanely old ruins, you can still get a feeling of how important and awe-inspiring the city must have been way back then. Some of the buildings are gigantor, and so much gorgeous detail. The ruins include a library (the 3rd largest in the ancient world), super-baller terrace houses (these people flaunted their wealth like NBD), temples, bath houses, marketplaces, a brothel (weee), and stadiums. We hopped from a large coach bus to a dolmus (minibus - also my new faves) to the city of Selçuk, which is only 3km from the Ephesus ruins and the jumping off point for most tourists who visit Ephesus. 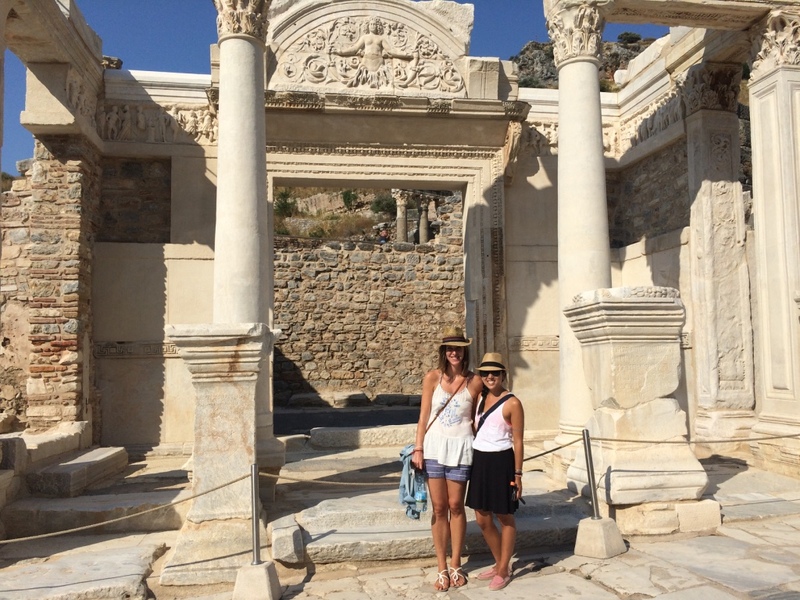 And then we went to Ephesus! We arrived a little past 4pm, so the sun was more subdued and all the cruise ship crowds were gone, which was so nice! As a tourist myself, is it ok for me to want to avoid hoards of other tourists? Meh. We hired a guide, who was really sweet but have to admit, I'm not sure I understood a significant amount of what he was saying. I think he was the last guide left. Still, even with the things I did understand, the place was FASCINATING. Also, Sam and I purchased ourselves Indiana Jones hats to avoid the sun, therefore da-da-da-DAAAAA, da-da-da-dum-dum (Indiana Jones theme song for you not in the know). Fancy walkway, a.k.a. Curetes Street. 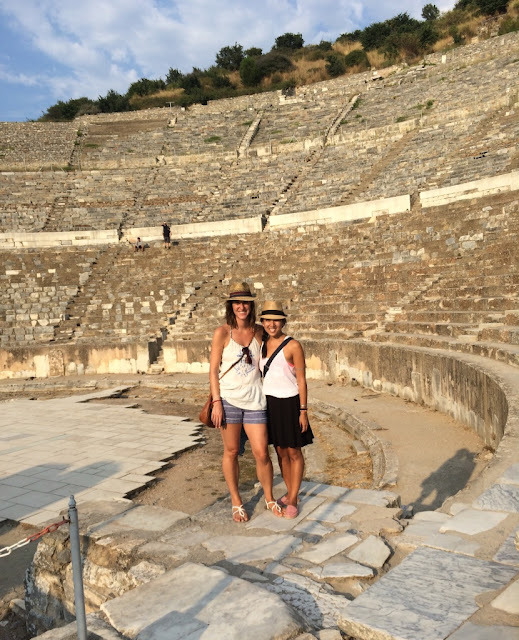 The business district; where ancient Greeks/Romans would stroll down and stop by a temple here, a municipal building there, maybe the baths, etc. The terrace houses! These were my fave. On display were six super-baller homes of the mega-rich during the Roman period. 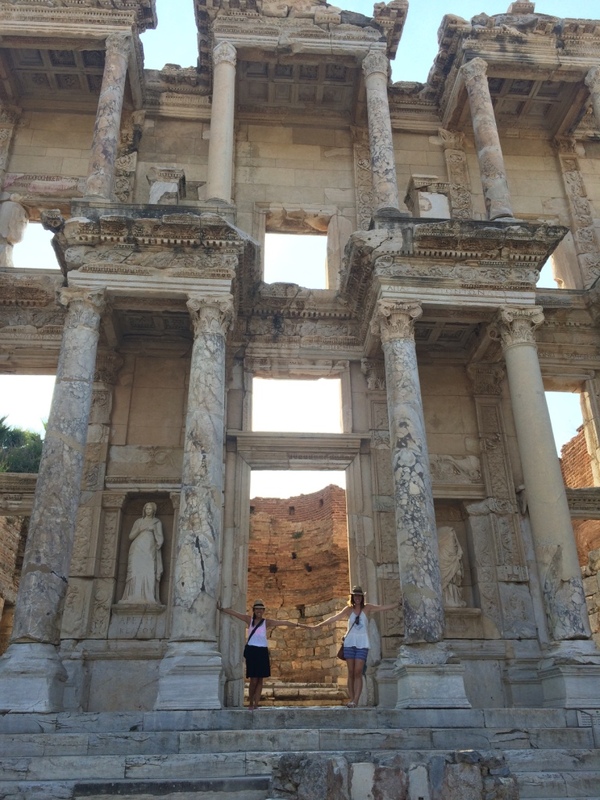 They had these ridic arched entryways, their own private bath houses, mosaic everything, frescoes, etc. 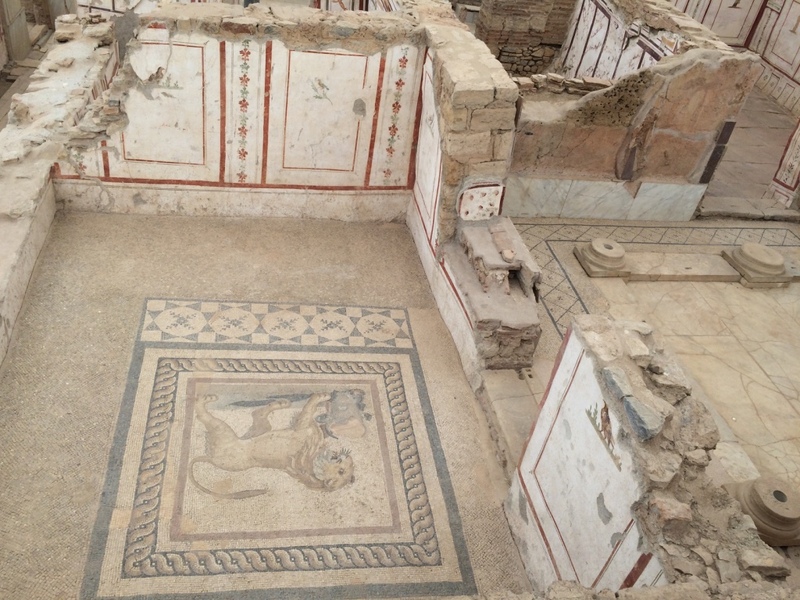 "Can you install a giant lion mosaic floor in my ridic oversized terrace house just to show how rich I am? Thanks"
Look how giant it is! Or look how tiny we are! 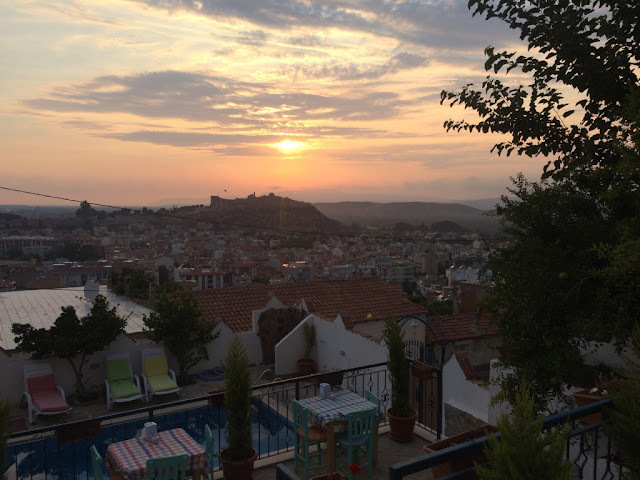 After our grand tour, we headed back to our hotel in Selcuk and had a home-cooked meal out on the balcony offered by the hotel, while also watching the sunset. We befriended one of the owners and helped him set the tables for dinner; thereby earning us free beers. 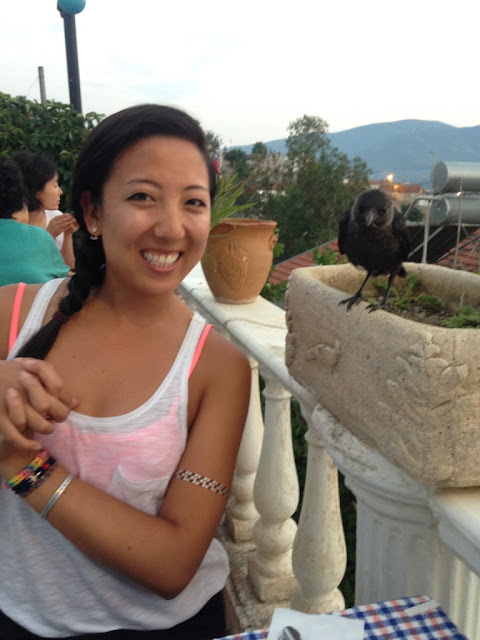 AND THEN THIS BIRD BECAME MY BEST FRIEND. The hotel people kind of adopted him (he's wild, but comes around mealtimes because he knows there's food). He even has some kind of very complex-sounding Turkish name. I really think he's hamming it up for this picture. My kind of bird. 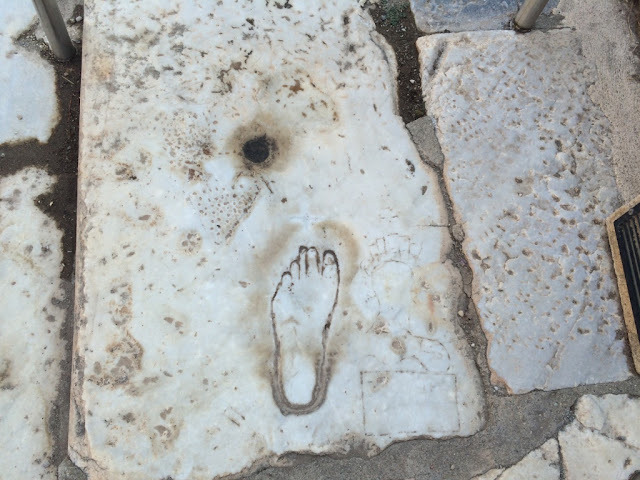 Back in the day, when Ephesus was still a functioning city, people who came to the city had to go into the bath house and wash clean before they could enter. 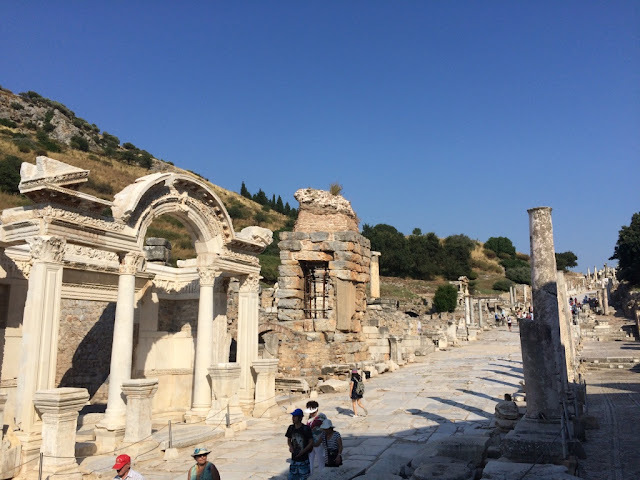 Ephesus used to be on the harbor, so visitors would bathe, then walk down this ridiculously long and gorgeous harbor path made of marble and flanked by 50 oil lamps into town. Walking down the path was so cool; it seriously was so grand and you could barely imagine how amazing it probably was back then. I love Turkish buses! 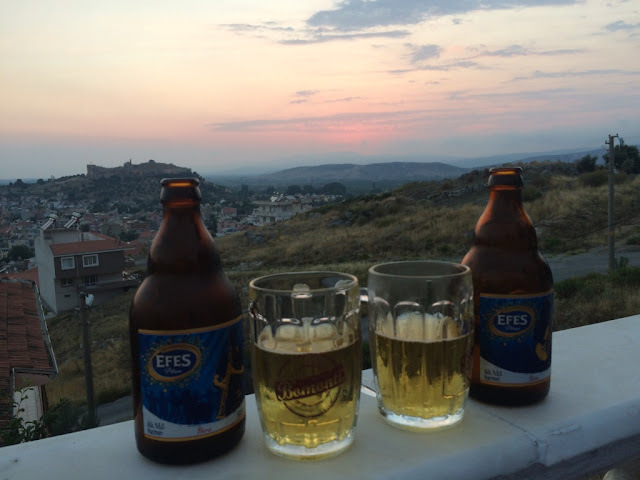 On our bus from Cesme to Izmir, we were not only served sealed cups of cold water, but they seem to be the most accommodating vehicles ever (i.e. waiting for people, letting people off to use the restroom, making sure to alert the only American tourists on board where our stop was, etc.). 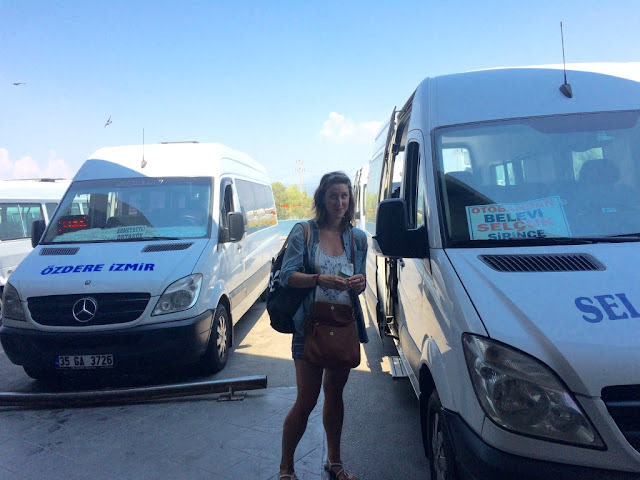 Also, once we switched to the minibus at the Izmir bus station, the minibuses all have hype men who stand in front and shout the bus destinations over and over. It's pure chaos, but makes it easy to find your bus - just listen for the city name you want to go to. Connie!! 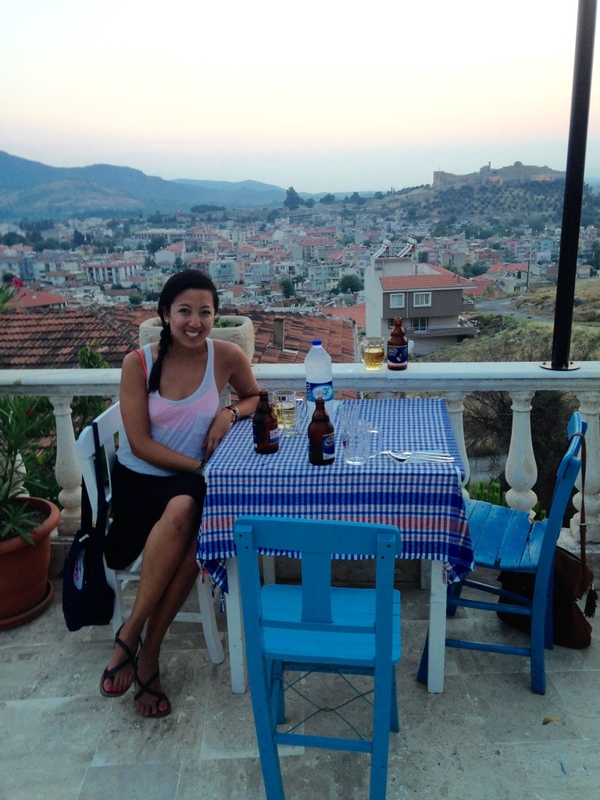 Heard from Lina from Tsao that you are traveling the world and blogging. Just finished reading all your posts. What an amazing journey so far!! Super jelly of all the desserts (why don't we have gelato on every corner?! ), beaches, breathtaking scenes, and adventures. Your blog is so funny and so you. Can't wait to read more. Safe travels!! Judy!! Yay I'm so glad you're following along! Let me know if you wanna join somewhere in the world this year!? Also, my ice cream diet is a huge problem.